Buell's founder, Erik Buell, has always provided innovative design solutions in his bikes, and the Firebolt is no exception. Like all Buells, the Firebolt uses a Harley-Davidson engine (Buell is owned by Harley) in a short, sportsbike chassis. But hidden inside this chassis are a few surprises. The hollow aluminium twin-spar frame doubles as the fuel tank, while the rear swingarm is also hollow, holding the oil tank for the dry-sump engine. These unique designs save space and weight, allowing the Firebolt a featherweight 175kg (3861b) claimed dry weight, as well as an ultra-short 1320mm (52in) wheelbase. The space created above the engine by the unconventional fuel tank allows a large-volume airbox, further boosting power and torque. The rim-mounted front brake is also a first on a production bike, and is designed to give stronger power and better cooling. The power from the six-piston caliper biting on the huge 375mm (15in) disc means only one disc and caliper is needed, further saving unsprung weight. This also helps the fully-adjustable Showa suspension give a well-damped, compliant action, as well as improving acceleration. It also means braking forces are not transmitted through the wheel's spokes, allowing a lighter wheel design. The Harley-based engine is a 45° V-twin with a curious mix of technology. Even though it uses air-cooling and pushrod overhead valve actuation - both now outdated technologies - it has an advanced, modern fuel-injection system to improve power and drivability while meeting tough emissions laws. Air ducting, large cooling fins and a fan keep the rear cylinder cool despite being hidden behind the frame, and the large-capacity silencer, essential to reduce noise emissions, is hidden away underneath the engine behond a stylish bellypan. There is a small, stylish twin-headlamp fairing which carves through the wind, and the instruments are housed in a lightweight magnesium dash, underlining Buell's determination to shed weight from every component possible. 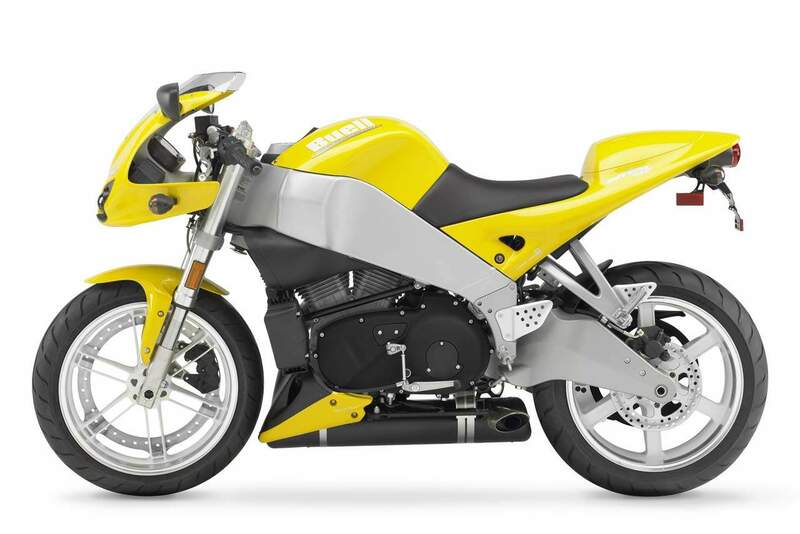 The Buell Firebolt XB9R is a frisky middleweight ready to eat up the road. The quick-revving Thunderstorm 984 V-Twin delivers 92 horsepower and 70 ft. lbs. of torque in a smooth, broad power- band for a powerful drive out of the turns. It is available in Sunfire Yellow with Sky White wheels and a Fluid Silver frame. Ok what's so different about it? The styling of the bike, especially the front end resembles an angry insect about to pounce. The overall size of the bike is tiny, nothing sticks out on this bike except the indicators (and they are made from floppy rubber to stop vibes destroying bulbs!). The first thing that strikes you about the Firebolt is it's dimensions and the incredibly steep front end. You get a 21 degree fork angle and just 84mm of trail, that's nearly 2 degs steeper than a GSXR or R6! So when you get on the bike you are actually looking straight down the fork legs at the front wheel spindle, scary! In this super small space Eric Buell has managed to shoehorn in the latest 984cc HD Sportster derived motor, which must have taken some doing as the wheelbase is only 1320mm between the axles! The Firebolt weighs in at only 175kg which is quite surprising looking at that HD Motor, but as you begin to look at the frame and so on, it all becomes clear just where the weight has been saved. Like many current sport bikes, the Firebolt uses a twin-spar aluminium frame, but this frame also serves as your 14 lt fuel tank! To top that off the super stiff alloy swingarm does double duty as the oil tank. Both these components are made in Italy by Verlicchi and Brembo of all people, so quality is shouldn't be an issue. Chassis design engineer Vance Strader decided to put all the bike's heavy stuff down toward the centre of the bike, this results in major components doing more than one job. The front brake on the Firebolt is the first of its kind on a production motorcycle. A single 375mm rotor bolts directly to the front wheel rim instead of the hub. Weight, especially the unsprung is the enemy, and braking loads are sent (almost) directly to the tyre, this make for less work for the inverted Showa forks and so the front wheel only weighs 4kgs and runs on a light, hollow axle. 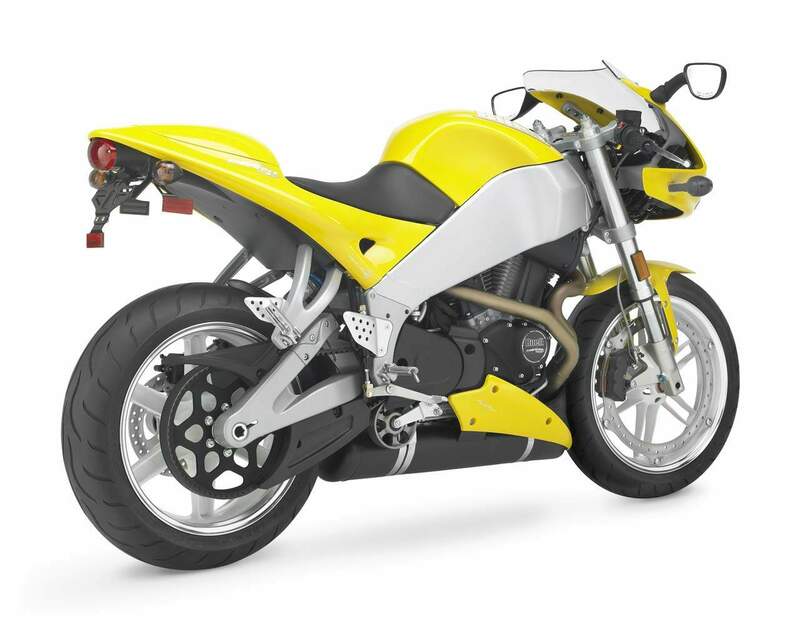 Buell's Uniplanar engine mounting system restricts the HD V-twin's thrashing and uses its structure as part of the chassis. Various strands of design DNA come from Harley-Davidson's XL family, but it's not really a Sportster engine. The gearbox, primary drive and clutch are all Buell existing parts, and the rest of the components are a mix and match, making the most of Harley's manufacturing capabilities. Everything from the pistons and connecting rods to the crankcases and valves are dedicated Firebolt. The high-flow cylinder heads are new, and NASCAR designed valve-train give the Buell a rev range up to the 7500rpm. The engine weighs 75kg dry, complete with oil coolers and all mountings, that's pretty good for a HD based motor but still 20kg heavier than KTM's new superlight V-twin. Keeping the weight down low makes the Firebolt feel incredibly light, it feels lighter than the 175kg (dry) would suggest. Sitting on the bike you get the feel of an exceedingly small bike, and that you are almost sitting over the front wheel. Everything looks neat and cleanly styled from the saddle. The instruments feature an LCD clock, two trip meters and mileage on reserve (a-la-Yamaha), and is all well placed. The speedo and rev counter are both analogue and do feature some of the most interesting number styles that I have ever seen! A little hard to read sometimes, but they match the bikes character well. The bars are a comfortable reach from the seat, but the foot pegs are mounted seriously high up and some riders will no doubt be put off by this position. Fire up the engine only after the V-Twin light goes out, this is what I was told, so this is what I did! It allows the fuel injection to set everything up ready for cold start, warm start etc and supposedly takes all the hiccups out of the mix during starting. When you eventually get it started after waiting (always first time mind you), the following mechanical commotion is pure HD Sportster, it is somewhat loud, but it's a dead giveaway as to what this bike really is. The Firebolt is perfectly cooperative around town, all the vibes on tick-over disappear and everything smoothes out from 3000 rpm on up. The clutch pull is on the heavy side and the gear selection is a bit 'clunky' to say the least! You certainly know when you have selected that gear, and clutchless changes on the Firebolt are a thing of the past. Take your time when you change gear, use a little clutch on the up-shift and you will be able to ride it smoothly. The engine definitely has smooth power delivery, and there is not as much vibration as I had first expected. The power output of the Buell is a respectable 92bhp and has a good torque figure of 68ft-lb. This torque really shows coming out of the corners, it does go a bit as you approach the red line but it feels like it has a little left, this might just be choked a little bit by the current emission standards though. Buell do a replacement twin exit pipe which releases a bit more power and torque, it also sounds more fruity and looks so much better than the standard one. The handling is really nice on the Buell, It's very nimble through the corners and the front end feels very well planted, but at the same time you can flick the bike easily from left to right. When you're in the corner, mid corner, you can basically pull the bike down for more lean angle if you want, in fact you can pretty much put the bike anywhere you want! the general idea when riding the Buell is to keep the revs somewhere between 5000 and 7200 rpm for maximum thrust, and be smooth, keeping momentum is the name of the game with the Firebolt, once you've got it, keep it! 4500rpm is about 75mph on the Firebolt, and considering its size the bikini fairing will give you a decent amount of protection upward of here. I doubt if you would ride it for much longer than about an hour or so at motorway speeds as the peg position and lack of seating room will see you pulling in for a rest and for more fuel. This will be about when the reserve light comes on anyway, expect about 120miles between fill-ups if you are relatively easy on the throttle. Going easy on the throttle become far less likely when you get to those twisty roads, this bike just becomes even more fun! The Firebolt chassis plays the starring role on twisty roads, on paper, all the extremist steering geometry could add up to one very twitchy little twin, but reality it doesn't, how it works is still a mystery to me, all I can say is that is does - very well. Another touch that will be immediately noticeable on the Firebolt is that smart little idler pulley keeping the belt drive tensioned so you don't have to. In fact, you cant' because it has a fixed rear-axle. The strangest thing of all though is the whir of the intermittent 2 speed blow-dryer that keeps the rear cylinder cool, it's just not something you would expect from the engine bay of a Milwaukee twin. The problem is, it tends to run on high speed for a while once you've parked, it's not quiet either which is sometimes a bit embarrassing when you turn up at the cafe or at the Sunday-morning hangout! As I said earlier, the Buell XB9R Firebolt is as far from a traditional Harley Davidson as a motorcycle can get. It has a truly innovative design, razor sharp handling, stunning looks, and could well start an exciting new performance tradition of its own. Buell's Firebolt is either a breakthrough or a bomb depending upon your expectations and preconceptions. 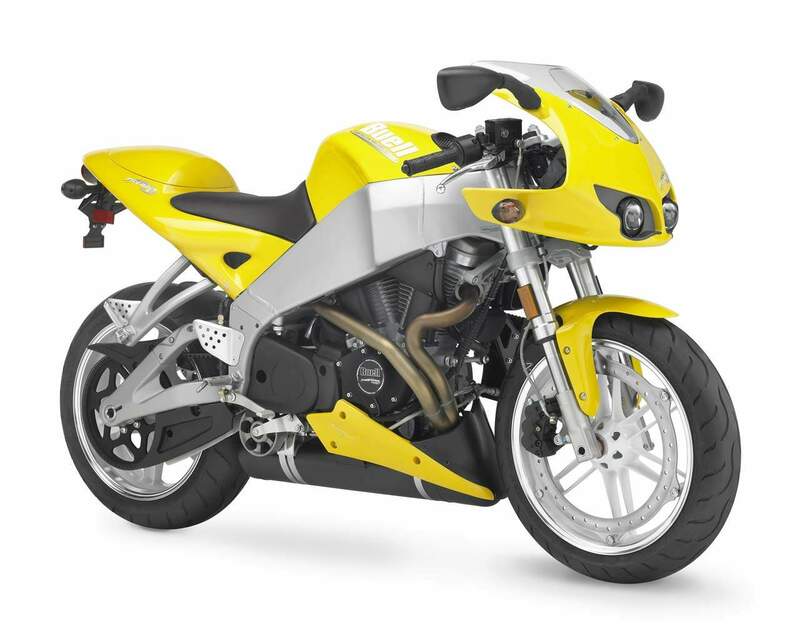 Devotees of American iron will probably want to have no connection with the Buell Firebolt, but the street fighter oriented among us will be dancing in the streets with this bike. If you're looking for the ultimate 'B' road weapon then look elsewhere, but if its unique you're after, and you can accept life strictly on its terms, then this could be your new bike. The Buell Firebolt is an absolute hoot to ride - its a pure fun package. It literally shouts out 'look at me I'm different', and it gets the looks and attention it deserves. I always get asked which bike is the best of the lot, I always answer 'if it has two wheels and a motor it's fun'. Much more important than that is to buy a bike that suits your needs and your character, The Buell will suit a lot of people, but it will not suit them, you can't just get on it and ride it straight off without first having some sports bike experience, that would be a recipe for disaster. If you prefer your biking to be anonymous then draw a line through this on your list, you'll be better off on a Honda or some other Japanese bike that just blends in with everything else! But if you dare to be different, want some fun in life and a bike that draws a crowd, then buy a Firebolt, you won't be disappointed. The Buell is very much like a bumble bee, not in colour or even loveable daftness, but in the fact that it really shouldn't work at all. The frame geometry is far too radical to be stable, the engine is just too heavy and slow revving and the gearbox is just too horrible. And yet this bizarre mishmash of ill suited components, seemingly cobbled together on the whim of an eccentric American, is one of the most potent track bikes you can imagine. The almighty clunk as you boot the thing into first and the strange delay between opening the throttle and the revs starting to build (matched only by the even stranger delay between shutting the throttle and anything happening as the huge flywheel effect keeps the revs up for a while) makes you instantly suspicious, and the apparent lack of power doesn't bode well. But the Buell has two secret weapons. The first is handling. You can, quite simply, throw this bike into a corner almost as hard and as late as you like and it will just drop in and go around. The second is ground clearance - no matter how hard I tried I just couldn't get anything to touch down. The combined result is a corner speed higher than pretty well anything else you'll encounter. On a trackday that either means leaving a gap behind the bike ahead of you so that he doesn't wreck your corner and then perhaps getting past on the exit or going in much harder and getting past on the way in. Or, of course, you can simply ride around the other bike, either inside or outside, mid bend. But one thing you won't be doing is going past them on the straights. Get used to being overtaken because it will happen a lot. That ancient engine has some limitations, after all, it would seem, although the optional performance pack liberates another 10 horses or so and sounds a lot better to boot. But also get used to grinning like an idiot, because that will happen even more.